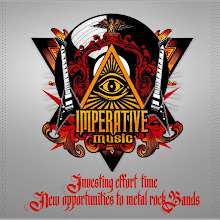 Imperative Music Agency Compilation: IN THE RIGHT TIME AND IN THE RIGHT PLACE, PROMOTE YOUR BAND RIGHT HERE, RIGHT NOW! IN THE RIGHT TIME AND IN THE RIGHT PLACE, PROMOTE YOUR BAND RIGHT HERE, RIGHT NOW! Start the year on the right foot; include your band worldwide in the Imperative Music Compilation CD volume 15 together with DESTRUCTION, DEATH, CRADLE OF FILTH and HAMMERFALL! Top Professional "Metal" Compilation! IMPERATIVE MUSIC COMPILATION CD will be released in April and we will be send CD's to Record-Labels, Distributors, Stores, Magazines, Radios and Webzines from Brazil, United States, Europe and Japan. Spread the word, share this post, thanks!